I humbly request that you attend the New York Television Festival screening of Johnny Berlin, a delightful film which features my name in the credits. Even if my name were not in the credits I would urge you to see this film as it is unusual and entertaining. Much more entertaining than the “comedy” group I saw mocking D-Day casualties a few weeks ago in the Lower East Side. If you live in New York it will be quite easy to attend the screenings since it is in New York and you live here. If you live elsewhere, please book a flight at your expense or try your hand at fractional jet ownership. 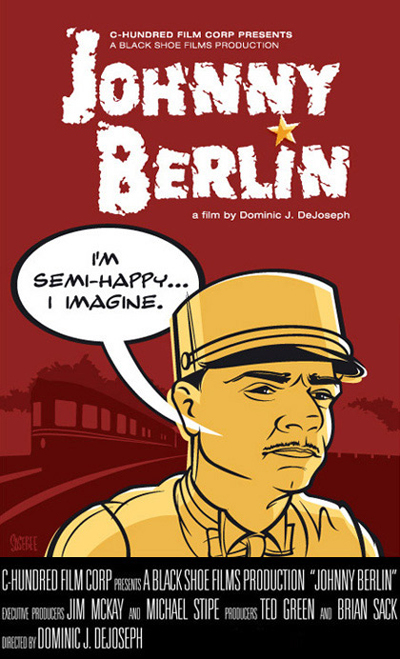 All that’s important is you attend the screening of Johnny Berlin, a refreshingly funny film directed by Dominic DeJoseph; executive-produced by Michael Stipe and Jim McKay; produced by Ted Green and most important to me, me. Johnny Berlin is the true story of John Hyrns, who Variety describes as “at once fascinating and vaguely troubled.” We all know guys like Johnny – intelligent, confused, under-employed, and considering moving to Phnom Penh to write the Great American Novel. Variety gave the film a lovely review. It was well-received at the SilverDocs Film Festival. We hope it will be well-received here. That’s where you come in. 450 West 15 Street in Chelsea between 9/10 Aves. Tickets: $15 or $35 for the posh seats.